super screen | Oh, The Glamourous Life! 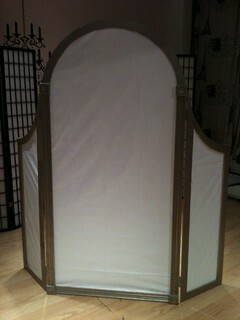 Before I get to your tip, I bet you all want to know what the finished Super Screen looks like! Well, you’re going to see it anyway. You can see one of the old screens looking on enviously from behind. Know the story behind your act. Why are you taking your clothes off? If you know your motivation, it makes for a more interesting number. No need to explicitly act out a skit, just understand how and why you get from the beginning of the number to the end. If you know, the audience will see your clarity of purpose. When last we left our heroes, there had been a lot of cursing down in the workshop at Stately Babydoll Manor. 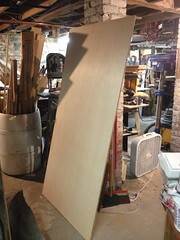 Armed with more plywood and a better plan, we began again. 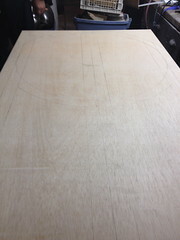 Here’s one wing, marked for cutting. 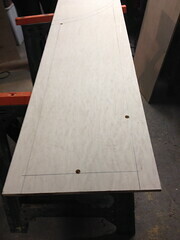 Those holes are so we can cut out the center, leaving a frame. Well, Scratch did all the cutting with the somewhat-scary jigsaw. My job was holding the plywood steady, which mostly meant draping myself across the sheet of wood, pressing down with all my weight and clinging to the opposite side of the sawhorse. That was kind of exciting. Tada! A cut-out wing! I love the graceful curve at the top. It mirrors the curve at the top of the front frame. Almost like we planned it that way. You can see how it will eventually attach to the front. Once everything was cut, it was time for painting. The color is “Champagne Mist”. Seems appropriate, no? After a couple of coats of paint, it was sealed with some clear polyurethane. Here’s the nifty part. 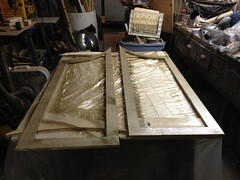 Instead of using fragile rice paper, we’re filling in the frames with Tyvek. It’s strong and waterproof. While it was probably overkill, the Tykev is both glued & stapled in place. 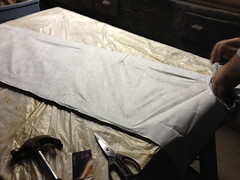 After the glue had a little time to set, we trimmed away the excess Tyvek. And after the Tykev went on the main frame, we added some lovely oak trim to jazz it all up. When everything was more or less set, we took all 3 pieces upstairs to attach the hinges. 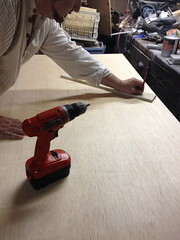 That was when we realized that the screws that came with the hinges were slightly longer than the plywood was thick. That was actually a good thing for the front screen because it further secured the trim to the frame, but it was going to cause quite a problem on the wings. Can’t have nasty sharp bits of metal poking out of my Super Screen! Fortunately we found just enough screws left over from a previous project which were slightly shorter and added a tiny washer to make them shorter still. All was well! For several years now I’ve been using a silhouette screen in some of my acts. It’s one of those lattice-work rice paper tri-fold screens you can easily get in a college town like Boston. But it’s far from perfect. The panels are a little narrow. The screen is a little short. The paper is delicate. It doesn’t travel well. Sight lines are often an issue. I’ve been dreaming of a custom-built screen for a long time. At last, it’s time for Super Screen. 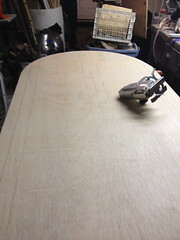 We started with a sheet of nice plywood, 1/2″ thick, that the lovely folks at the Home Depot cut down to 6′ by 3′. It’s not light. Carrying it down the basement stairs to the workshop by myself proved impossible. 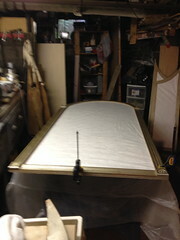 First step, Scratch drew the outer frame. 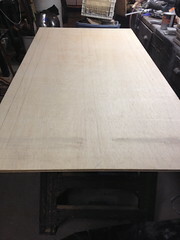 We’re going to use the wood in the middle for the side pieces (wings). Waste not, want not! Then he drew the lines for the wing frames. 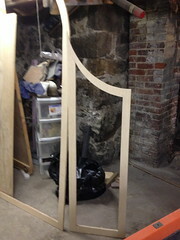 We’ve been using a T-square that is conveniently the same width as the frame. The top of the screen is going to be curved. The T-square is useless for that, so Scratch made a compass out of a piece of scrap wood. Once everything is drawn, it’s time for the scary part — cutting. That’s when we realized that despite careful preparations, we needed some new saw blades. It’s not a project until you have to run out to the Home Depot in the middle! With fresh blades in the jigsaw (a vintage one Scratch inherited from his grandfather), the cutting began. This is where I stopped taking pictures because things began to go awry. A clever plan designed to make our lives easier did not. And then… you know the saying “measure twice, cut once”*? Well, it has a corollary: “measure once, curse twice”. Let’s just say that despite a lot of measuring, there was a lot of cursing and there will need to be a trip back to the Home Depot for some more plywood. 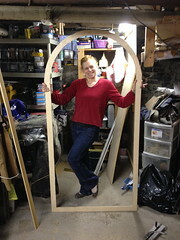 However, the main frame of the screen is done! *You do, because you read my Friday Tip.